Here is the famous Hitachi tree at Moanalua Gardens. It is a large monkeypod tree with a distinctive umbrella shaped canopy and is registered with the city as an exceptional tree that cannot be removed or destroyed without city council approval. The Japanese electronics firm Hitachi has used it as their corporate logo since 1973. 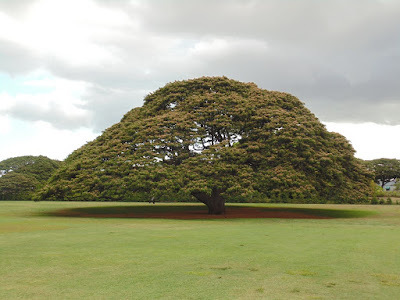 The revenue generated by the exclusive worldwide rights of the tree’s i8mage for promotion purposes partly fund the upkeep of Moanalua Gardens. This entry was posted on Monday, July 13th, 2015 at 12:41 am	and is filed under CityPhoto, Feature, Nature, cultural, Hawaii Photo of the Day, Attractions. You can follow any responses to this entry through the RSS 2.0 feed. You can leave a response, or trackback from your own site.